Hi guys! 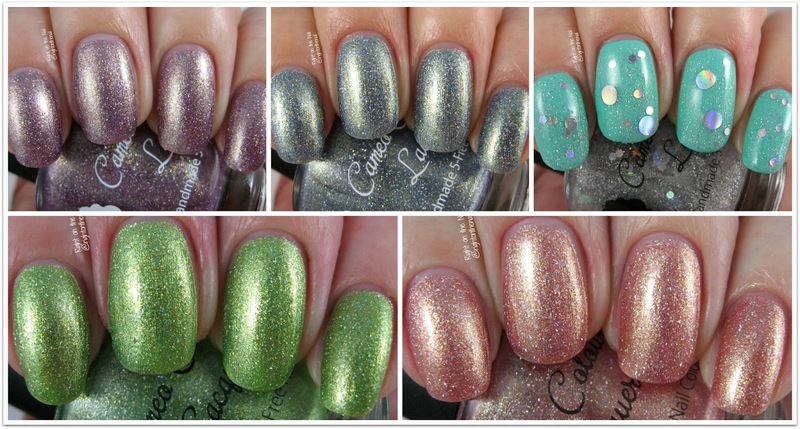 I'm back with a brand new collection from Cameo Colours Lacquers. I haven't reviewed Cameo's polishes before, but she did work with me to make a new Nibs & Nails polish which will be coming up shortly. I was so surprised with her work and quality of polishes that I just knew I had to get her next collection. Floral Feelings is a 5-piece collection (4 polish +1 glitter topper) releasing this Friday, May 5, 2017 on the Cameo website. Stay to the end of the post for more information and pricing. It's time for May flowers, so this collection is appropriately themed for spring wouldn't you say? Follow me after the break to see full reviews! Sure, we normally associate Mums with Fall, but their foliage is already out. Chrysanthemum Joy is a yellow based metallic green with loads of gold shimmer and holo silver micro flakes. These metallic polishes are reminiscent of the ones from Pahlish, but Cameo has her own special blend which contains more flakes and contrasting shimmer. I used 3 coats for my pictures, but if you have shorter nails or use thick coats, you would be able to get away with 2. The formula was smooth and buttery with no issues to note. In retrospect, Dew Drop Delight would look better over a darker base, but it's too late to do anything about it now. I mean, it looks nice here, but I see a missed opportunity. This is the glitter topper of the collection and contains silver holo flakes with 3 different sizes of circle glitter. I love circle glitter, but beware that they are a bit difficult to get out. I went ahead and did a normal coat followed by dabbing the larger circle glitter down. Make sure to turn the bottle upside down for about 30 minutes to allow the larger circles to sink to the top for easier application. Somehow the large circle glitters laid down nicely and didn't need extra coats of topcoat. I love hydrangeas. My wedding bouquet had a base of hydrangeas and my mom is really good at growing them. Did you know the flower color depends on the soil of the pH the hydrangeas are growing in? Acidic soils promote the pink flowers while alkaline soils normally grow blue flowers. The more you know. Anyway Hydrangea Serenity is a light icy blue with gold shimmer and silver holo micro flakes. It's so hard to pick a favorite from this collection, but if you forced me to say, then it'd probably be this one. Again, I used 3 easy coats, but you could likely get away with 2. I think I mentioned how much I love rose gold last week (or the week before?). In case you missed it, I'll say it again: I love rose gold. My phone is rose gold, and if a piece of jewelry has rose gold, then I'll probably like it (or buy it). Rose Bliss is one of those work-appropriate colors with some oomph. It matches my skin a little bit, but I think it still works. It's a metallic rose base with gold shimmer and holo micro flakes. It applied like the other metallic polishes (i.e. perfect) and I used 3 coats for the swatches. For a second I thought it said Euphorbia like the plant. 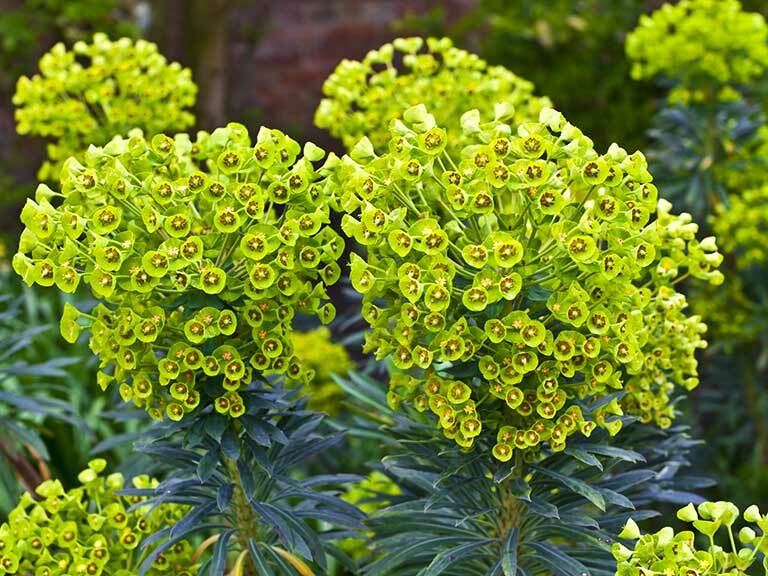 Don't know what a euphorbia looks like? Crazy, right? Anyway, violets are pretty, too! Right now we have an African Violet growing in our house. Apparently they're sort of hard to grow, but my husband has a green thumb. Violet Euphoria is a metallic lavender with gold shimmer, purple micro flakes, and silver micro flakes. This is safely my second favorite from the collection. All of the flakes really adds a lot of dimension to the polish. I'm pretty much a broken record because it needed 3 coats for full opacity (but you may need 2...YMMV). Overall, I had zero issues with the formula or application of these polishes. You will need to do a little extra with fishing for glitter in Dew Drop Delight, but that's always how it goes. My top recommendations would be Hydrangea Serenity and Violet Euphoria, but you can't go wrong with any of them. All polishes except for Dew Drop Delight will retail for $10.50, while DDD will set you back $9. If you buy the whole collection, you will save $5 ($46 without shipping). Cameo was a pleasure to work with, and I don't know why she is an underrated indie brand. If you haven't tried her, please consider the Floral Feelings Collection. Stay up-to-date on all things Cameo Colours Lacquers by checking out their website, Facebook, Instagram, or Twitter pages.